The natural age structure of wet eucalypt forest has important implications for biodiversity conservation and the mode of wood production. Southern Tasmanian wet eucalypt forests were sampled to describe age class variation and to test the following hypotheses that relate to it: (1) Eucalyptus regnans stands are more likely to be single-cohort than Eucalyptus obliqua and mixed stands; (2) old-growth trees are associated with multi-cohort wet eucalypt forests; (3) the E. regnans stands are more multi-cohort than Victorian E. regnans stands. Data from 762 stands, all with either E. obliqua or E. regnans were analysed to determine how stand characteristics related to forest type and to the presence of old-growth trees. Over half the stands studied were multi-cohort. 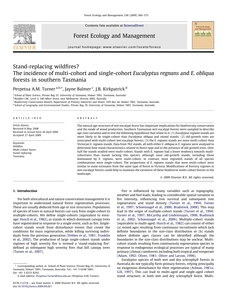 Stands with E. regnans had a lesser tendency towards multicohortness than stands lacking this species, although most old-growth stands, including those dominated by E. regnans, were multi-cohort. In contrast, most regrowth stands of all species combinations were single-cohort. The proportions of E. regnans stands that were multi-cohort were similar to some estimates from the same type of forest in Victoria. Modifications of forestry regimes in wet eucalypt forests could help to maintain the existence of these biodiverse multi-cohort forests in the landscape.